The Kelty Hula House is designed for fun. This is a simple, no-nonsense camping tent made to get you and your family out of the house for the weekend and into the wilderness. It's easy to set up, easy to take down, and easy to have a blast with. The Kelty Hula House was not designed for heavy-duty climbers and hikers. It's features aren't extensive or particularly advanced. Instead, think of this as a starter tent, or a novice shelter. You can have fun with it, as long as you aren't taking yourself too seriously. This means camping in mild climates and making sure you have a big enough model to comfortably fit everyone inside. Why is this tent so great for families? It's simple to pitch, there's plenty of head room inside, it's tough against the wind, and it's pretty lightweight, especially considering the amount of interior space you get. The Hula House is not terribly innovative, but it gets the job done for those looking for a simple shelter. 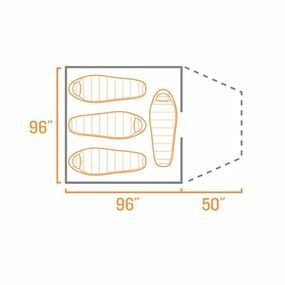 Take a look at the technical specifications of the Kelty Hula House 4-person tent for a clear idea of what it's capable of. 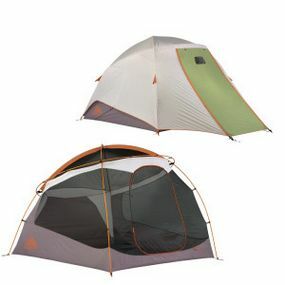 Pack Size -- 26" x 10"
The design of a tent's walls has as much to do with its interior room as the actual floor dimensions. Rounded walls eat away at the floor area, giving you less room to work with. Vertical walls, on the other hand, as with the Kelty Hula House, help keep the interior very spacious. One of the best features of the Kelty Hula House is its strength. Even when it's put up against extremely high winds, this tent will stand tall. This means you don't have to worry about finding a natural wind block for the Hula House, because it can stay tough without one. The vestibule is quite small, vertically speaking. This makes getting in and out of the Kelty Hula House a bit of a pain. This can be especially irritating when you have four-to-six people using a tent with just one entrance. The materials used with the Hula House aren't of the highest quality. For example, the Velcro patches used to keep the vestibule door closed have been known to come apart quite easily--even after just a single use. Professional campers may want to set their sights on a more advanced shelter, but for families who are looking for a simple tent to take out into mild climates on summer weekends, this may be perfect. Both models are less than $400 , they offer great defense against the wind and rain, and as long as you don't take too many people along with you, the vertical walls help provide ample amounts of living space. This is a tent that was designed for fun, and that's exactly what it's capable of offering. Have you used this tent? Share your review and let us know how it worked for you!